Probably not everyone knows that Frederick II of Swabia – emperor and king of some of the biggest empires of the past – was actually born on 26 December 1194 in the region Marche, precisely in Jesi. A casualty indeed, that appointed the city of Jesi to every encyclopedia and history book. A museum in Jesi is named after him, his birth city paid homage to the life and actions of the great emperor and patron who changed history. Frederick was born accidentally in Jesi, where his mother Constance settled down while her husband was fighting during the second (and victorious) invasion to conquer the Kingdom of Sicily. After his birth, two of the most important Houses at the time reunited under one single person: Swabia and Altavilla. Frederick’s destiny was to become important, but he actually made much more than expected. He was born from a happy and strategic marriage: Frederick was the son of Henry VI – Emperor of the Holy Roman Empire, King of Germany and Sicily – and Constance of Altavilla. Heiress of the Kingdom of Sicily, Constance had a key role in guiding the Empire and her son’s future. 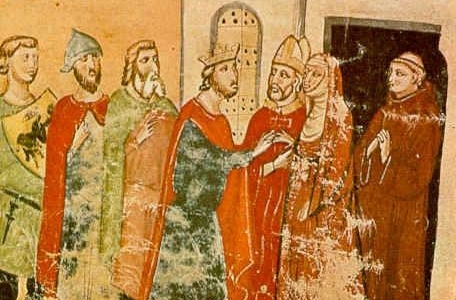 In 1197, when Henry died, Constance took the powers following her husband’s policies, and to do so, she placed Frederick under the protection of the new Pope Innocent III, who became her son’s tutor granting him a brilliant career and safety as well. He was crowned King of Sicily aged 4, and under the protection of Pope Innocent III, Frederick was raised and educated to law, administration, but also arts and writing. Frederick was a great king and emperor of the Holy Roman Empire, and the funder of the first public and laical university in the western world, in Naples, and substantially contributed to Italian literature – as we mean it today – by the constitution of the Sicilian school of Poetry, whose scholars invented the “sonnet”. He was a writer himself, Frederick gathered many artists around his court. He was an attentive and generous patron; he was also a hunter and a clever strategist: because of all this, he was aptly named Stupor Mundi (splendor of the world). Jesi celebrates the genius and greatness of the emperor Frederick II with a one-of-a-kind museum that evokes his life, history and projects: from his birth to the conquest of kingdoms, through his frequent activities in the literary and artistic fields. In Palazzo Ghislieri – the specific place where Frederick was born – you can see installations, multimedia contents, manufactures and much more over 16 rooms. A celebrity of the region Marche for destiny, who left insoluble traces of his presence from Jesi to the whole world.